Underbust urban camouflage corset, inspired in biker jackets, with decorative lapels. Completely lined, steelboned and reinforced. Features front zipper fastening and back lacing. With a delightful small pocket. 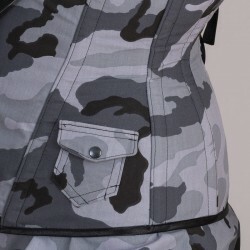 The style of leather jackets applied to this grey underbust urban camouflage corset. The iconic jacket's inspiration translates into the decorative lapels and the small pocket which is funny yet useful. With full lining, reinforcements and steel bones, this corset has a seductive, comfortable and curvy silhouette. Features metallic front zipper fastening and back lacing with modesty panel. Would you like to know more about our corsets? Come and visit its information page. And even if you love the design, it is not your color, contact us and maybe we can fix that! Take advantage of the military print and complete your look with the gorgeous forage cap and your favorite dress.